I firmly ordain to all friars that in no manner may they receive money for themselves or through the mediation of another person (Peters, 244). The Spiritual Franciscans hoped to live in the manner set for them by St. Francis. They were condemned as heretical for not complying with the pope's ruling that Francis' Testament not be binding. Testament of St. Francis The document at the center of the Spiritual controversy. Also from the On Line Reference Book Encyclopedia. An example of the Fioretti or Little Flowers. Umbertino da Casale 's 1312 "Violations of dominium and usus," excerpt. 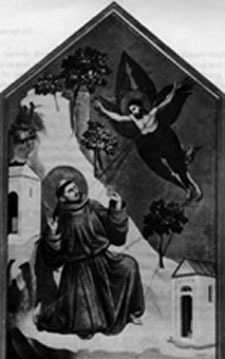 Bonaventure A biography of the Minister General of the Friars Minor in the 13th century who was accused by Spiritual Franciscans of suppressing the "true Francis."